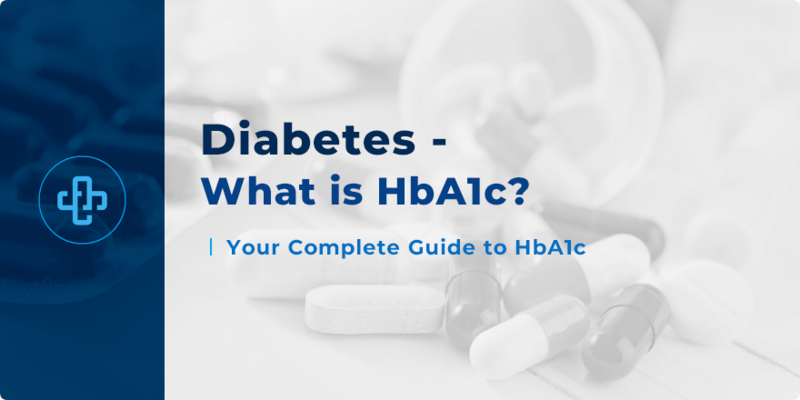 What is HbA1c? Your Essential Student Guide! Not heard of HbA1c? You should have! Approximately 30 million people in the United States have type 2 diabetes. HbA1c is a means through which blood glucose levels can be measured. It is an indicator of what blood sugar levels have been like over the previous 8 to 12 weeks. Why 8 to 12 weeks, though? Because 8-12 weeks is the average lifespan of a red blood cell. Red blood cells contain hemoglobin – the molecule that carries oxygen, and the molecule which gives erythrocytes their characteristic red hue. Once glucose adheres to this molecule, the resulting molecular entity becomes “glycated hemoglobin”. When we measure HbA1c, we measure blood sugar levels over the lifespan of the red blood cell – that is to say, over the past 90-120 days. Glycated hemoglobin allows us to make this measurement. The higher the HbA1c, the more likely the patient is going to experience complications from type 2 diabetes. In summary – HbA1c is an excellent and accurate gauge of long-term blood glucose levels. Patients with type 2 diabetes should have an approximate HbA1c value of 6.5%. A normal range for non-diabetics is less than 6 percent. 6.5% is the equivalent of 48mmol/mol. Bear in mind that 6.5% is a not a fixed target. A patient’s precise target depends on their individual circumstances and the clinical conclusions drawn by their physician. A small change in HbA1c percentage can have a major implications – both positive and negative. Studies show that reducing HbA1c by 1% can cut retinopathy, neuropathy and nephropathy by as much as 25%. In diabetic patients, a one-percent reduction in HbA1c reduces the incidence of amputation by 43%, cataracts by 20% and heart failure by 17%. These are clinically significant statistics. So, how does HbA1c levels compare with a standard blood glucose test? How can we compare HbA1c and blood glucose? Diabetic patients should have their HbA1c tested at least once annually. Bear in mind that blood glucose levels fluctuate on a minute-by-minute basis. Values are typically taken when the patient has fasted. Disease has an important role, then, in the correct and accurate interpretation of HbA1c values. In summary, HbA1c is an important indicator of long-term blood glucose levels. For diabetic patients, targets may be set higher than normal. This may be necessary in cases where antidiabetic medicines are expected to dramatically induce hypoglycemia. In the general population though, HbA1c levels should be lower than 6%. This prevents onset of prediabetes and its progression into type 2 diabetes. Exercise, healthy eating and fat loss contribute to lower HbA1c levels. Check back to our pharmacy blog for even more great articles on clinical pharmacy. In the meantime, join our newsletter today (see above) to receive all the latest facts, articles and offers direct to your email!